The fax machine has not gone anywhere in medicine. This so-called “ancient relic” is still operational and is considered a simple, yet powerful tool for those in healthcare, despite the other more modern modalities of exchanging information. According to newly released federal data, almost three-quarters of nonfederal acute care hospitals routinely use faxes to receive summary of care records from providers outside their system, according to the data released by the Office of the National Coordinator (ONC) for Health IT. Receiving records via fax is the most popular form of use for the fax machine use. For example, more than 40 percent of the health systems measured said they “often” use fax. Only 27 percent of the same folks said the same about using a stand-alone health information service provider. The industry’s preference for fax likely has a lot to do with the Health Insurance Portability and Accountability Act (HIPAA), passed by Congress in 1996. The law set the creation of privacy standards for health information and required healthcare providers to take “reasonable safeguards” when sharing patient data between labs, hospitals, specialists and insurers. The Department of Health and Human Services (HHS) names the fax as an acceptable method of transmission of medical records, test results, instructions and treatment regimens. Email use, on the other hand, is considered too insecure a medium for the sharing of medical records. Emails can be encrypted, but faxing information remains the simpler process. About 80 percent of hospitals used more than one electronic method to send records in 2017, but more than 25 percent of hospitals are not receiving records electronically at all. The number of methods used is a detriment to health systems, ONC says. 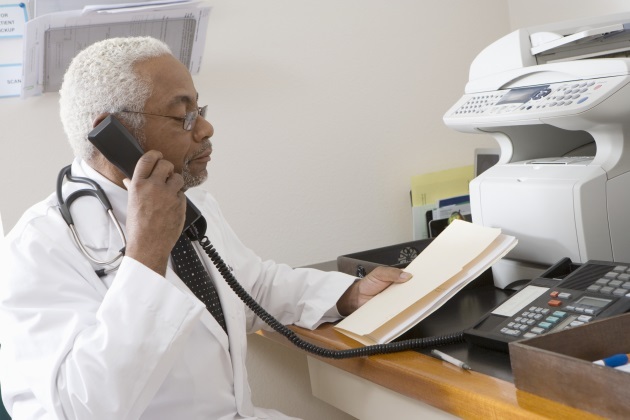 Faxes, though, just tend to be more convenient to use when dealing with physical patient files, especially in environments that until quite recently relied upon paper records. For example, scanning and sending an attachment can be done in one step and they could easily have been placed into the file. Another challenge for electronic health records is that they often do not speak to one another. Fax machines, despite the brand or maker, easily connect and communicate with other fax machines. In the world of healthcare interoperability, fax machines still seem to have a leg up on electronic record sharing solutions. But, younger providers and caregivers don’t understand how to use fax technology, and are often baffled by it. Producers of vinyl records might once have felt similarly to those who use fax technology. Why replace what some consider the best medium to express a message?